University of Kentucky Selected Most Bicycle-Friendly College in the U.S. Bicycle Magazine has selected the University of Kentucky as the most bicycle-friendly college in the United States. The university was chosen out of 45 institutions, ranging from small, liberal-arts colleges to large, public universities, according to The News Tribune. 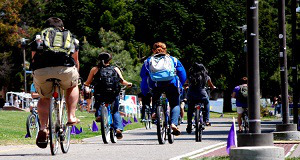 UK’s innovative rewards offered to students, faculty and staff and dedication to supporting cycling stood out compared to other schools, said Amelia Neptune, program director at the League of American Bicyclists. Though the university was nationally recognized, there’s still room for improvement, said Sandra Broadus, UK’s alternative transportation manager. UK is going to open its first indoor bike room in the near future, Broadus said.